Usually the boatless among us hike to rapids and watch/photograph our kayakers or find something to amuse ourselves nearby. (Okay, sometimes we sneak ice cream cones!) 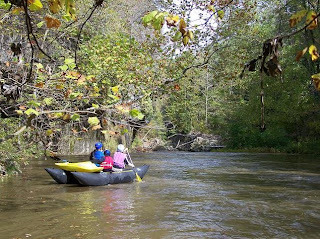 But, since Lizzy and I haven't quite taken to kayaking (that whole being upside down underwater thing - I know it's an irrational fear, but we're still embracing it nonetheless), we always miss out on the fun. 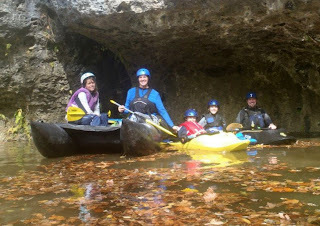 We love rafting, though, and the trips we've been able to bum with generous friends. When Shredders started showing up on trips, we thought it looked like the perfect boat for us. It shreds the rapids, so is nice and stable. You're not strapped in with a skirt. If you flip or fall out, you simply grab it and climb back on! Thanks to Rick Koth for this pic he got of us transporting Matt and his kayak around the corner on Rocky Fork. That's another thing - the Shredder is a great rescue boat. Convenient for carrying gear, lunch, and even boats. 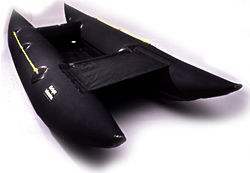 We can also get the water out of a kayak without going to the bank. 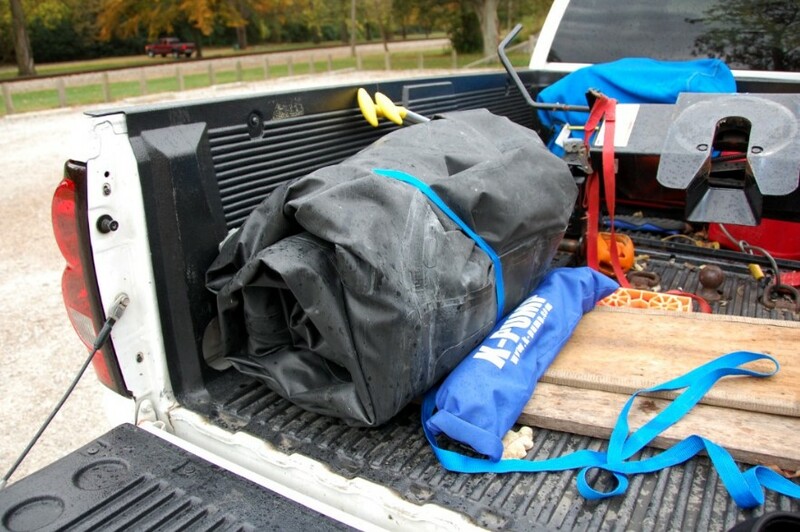 Plus it deflates and rolls up to the size of loaded backpack! 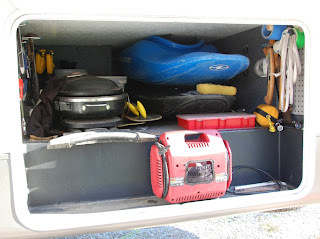 How do we store three kayaks and the Shredder in the RV? It's pretty easy when two fit in the basement (side under-storage). The Shredder goes in the front porch (front storage behind hitch). The third (and smallest) kayak is on a bike rack on the back of the RV. We went to Airtight Inflatables (a very small shop in Ohiopyle) and got to see how they were made. We met Tom Love, who invented and designed the Shredder and has some great stories. It was very cool, especially for the kids, to see the materials used and the whole building process. Thanks to Joe Pierce for getting one of (many of) Matt's runs on video! Why don't I have pics of the crazy rapids? Because I was running them for a change!! Yep, a waterproof camera is on my wishlist now. Very cool! I've never heard of a shredder but it looks like tons of fun! And perfect for an RVer! "Shreddie" sounds like a lot of fun! We carry a small raft with us. How many people is a Shredder designed for? It is fun! There are 2 and 4 person models. Ours could hold 4, but it's best with 2. Though 2 adults and 2 kids would be just fine.